Distinctively ABQ High Desert custom home in the Wilderness Estates, where nature & luxury living come together at the base of the Sandias! 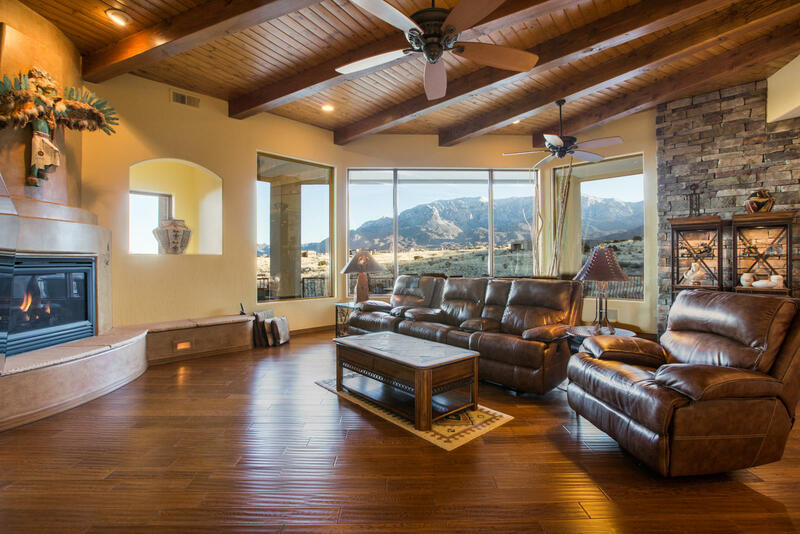 Breathtaking vista captivate from the front door & throughout! Over 3400 sqft on main level featuring gorgeous finishes, 3 gas fireplaces, wood floors, beamed ceilings, stone accents, fully equipped kitchen w/bar seating, Halbert cabinetry, Wolf ovens, cooktop & warmer, subzero, formal/informal dining areas, great room, guest suite & separate Owner's retreat featuring onyx jetted tub & coffee bar. Walkout lower level w/2 spacious bedrooms & baths, game room & OH those expansive outdoor living spaces with over 1300 sqft of covered patios, sit back, relax & experience the essence of this extraordinary place, views, fresh air, starlit skies & much more!